Most of the Susu live in Guinea, West Africa. 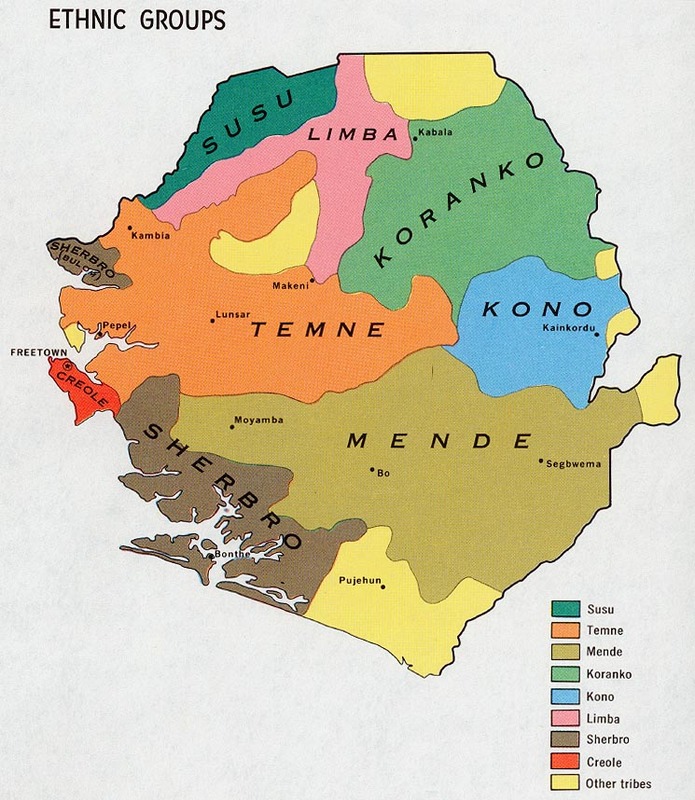 However, other smaller tribes are also located in the neighboring countries of Sierra Leone and Senegal. They moved to their present location after 1725, when the Fulani attempted to dominate them and managed to convert them to Islam. 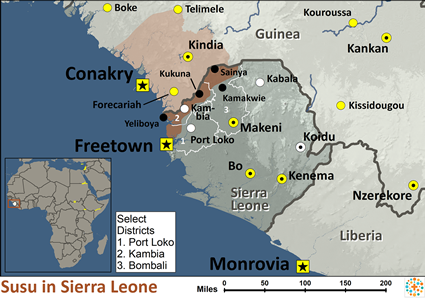 Today, the Susu live in the Kambia, Bombali, and Port Loko districts of Sierra Leone. The Susu language, called Soso or Susu, serves as a major trade language in the region and is almost indistinguishable from the language of the Yalunka. This close linguistic relationship supports the theory that the Susu and the Yalunka were once members of the same tribe in the Fouta Djallon region of Guinea. They were separated by Fula invaders, who forced the Susu to travel southward, absorbing other peoples in the process. Today, young Susu boys seem to be disillusioned with both Islam and socialism. Many have moved to the urban areas where poverty and idleness are serious problems. The Susu are primarily farmers. Rice and grain are the two principal crops; however, pineapples, mangoes, and coconuts are also grown. The women make various kinds of palm oil from palm nuts, as well as peanut oil and soap. In addition to farming, fishing and salt production are important enterprises to the Susu economy. Salt is produced during the dry season, and it can take up to three months of intense work to produce anything substantial. The Susu are also well known for their trading, leather work, and metal work. Susu houses are made of mud or cement blocks, depending on the resources available. The roofs of the urban homes are usually made of corrugated iron, while those in the more rural areas are still thatched. Houses are often built large enough to accommodate extended families. Although electricity is available in most places, cooking is still done over open fires. Unfortunately, clean, running water is not yet available for the Susu, but efforts are being made to dig wells throughout the region. Although Western clothing is available in the markets, most of the Susu women prefer wearing their traditional African styles, which include long skirts that usually reach their ankles. Older men commonly wear loose fitting cotton robes, while the younger men prefer Western style clothes. Relationships are very important in the Susu culture, yet there are many conflicts between neighbors. These disputes frequently involve disagreements over money or property. The extended family is also very important in their society. Polygyny (having multiple wives) is allowed under Muslim law but is only practiced by those who can afford it. Each village tends to have its own "wise man," as well as an elected or appointed leader whose task is to help resolve conflicts. The Friday meeting at the mosque (Muslim temple) remains an important social event. Formal education for the Susu follows the French academic system and is offered only in the French language. In the past, the government tried educational programs in the local languages but were alarmed at the high rates of illiteracy in French that resulted. Consequently, these programs did not last. 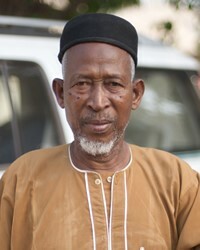 The Susu in Sierra Leone are almost entirely Muslim, and Islam dominates their religious culture and practices. Most of the standard Muslim religious festivals are observed. Their most important festival is the celebration at the end of Ramadan, which is a month long period of prayer and fasting. Because of the history of Christianity throughout the region, the Susu have been somewhat evangelized. The New Testament is available in their language. However, there are only a handful of known Susu believers in this region. The power of Islam needs to be broken over their lives in order for the Gospel to spread. Prayer is the key to seeing them reached with the Good News. * Ask the Holy Spirit to stir the hearts of the Susu youth and reveal to them that only Jesus can fill their lives with true peace. * Pray for God to create an openness to Christianity within the hearts of the Susu. * Pray that the Lord will raise up laborers who understand the Muslim culture and who can effectively take the Gospel to these precious people. * Ask God to create a clean water supply for the Susu and grant wisdom to those who are currently working on this project. * Pray that God will provide new contacts and strategies for the missions agencies that are trying to reach the Susu. * Pray for the Susu living in the urban areas to emerge from poverty. * Pray for the salvation of key Susu leaders who will boldly declare the Gospel. * Ask God to raise up strong local churches among the Susu.View Susu in all countries. Location in Country: Northern province: interspersed throughout western sections.